Give your child a Bible. You’ll never know the difference it could make. Over the long weekend, M spent a night over at her Grandpa’s. She came home the next day with a treasure: One of my old Bibles! I guess at one point between moves we left some books there. 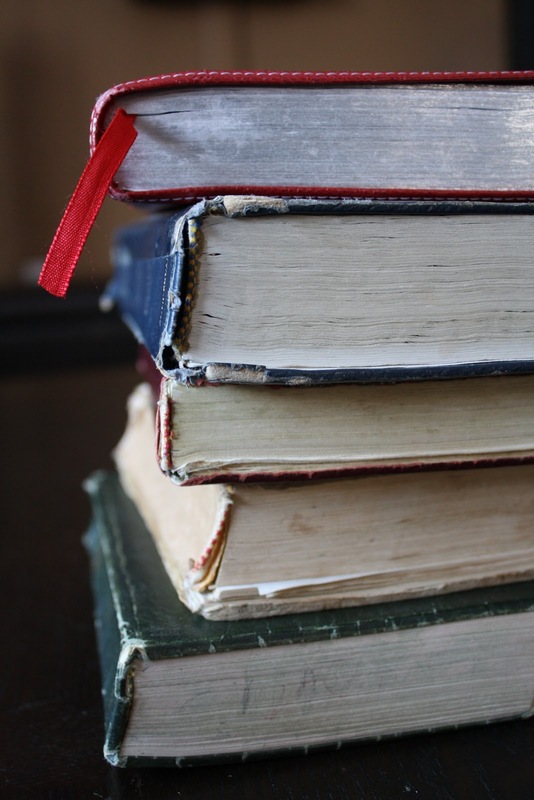 She had been going through the bookshelves and brought home Little Women and Jane Eyre, too; some good classics. 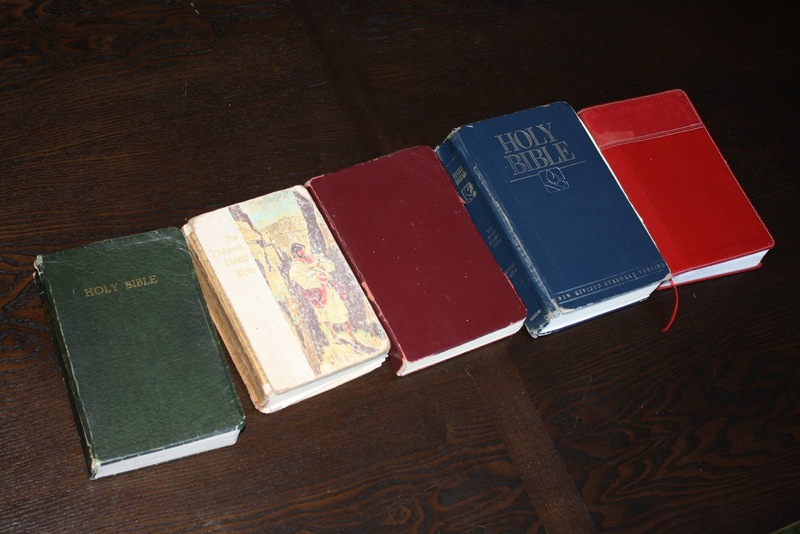 I took some photos of all my old Bibles with the set now complete (the one she brought was that second one) and got to thinking about what message they send… I think there’s a few, but what impressed me most was about the influence parents have. Those first three Bibles? They all have my Mom’s handwriting on the dedication page, with my name and the dates of when I was five years old, nine years old, and for my 15th birthday. They went from the King James to the Children’s Living Bible (easier to read), to the New American Standard Bible (best mix between readability and literal translation). That middle one saw me from 15 to 22, including four years of Bible school, and was falling apart. The fourth, the New Revised Standard Version, was new from Neil for our wedding. Then when that one was falling apart, Sean and I got each other new TNIV’s (Today’s New International Version), for our wedding. Parents and spouses – people in your life who should encourage your spiritual self; I’m so glad they did for me. Thank you. 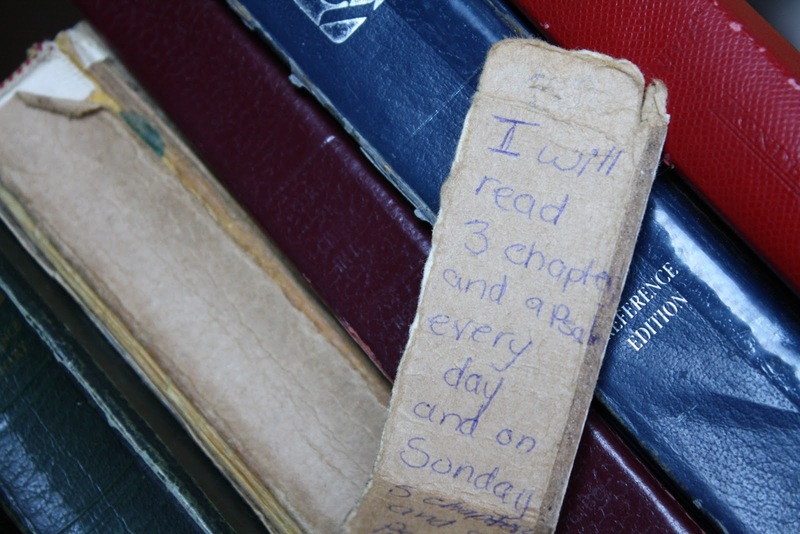 Madeline got a kick out of the spine that had fallen off and that was stuck as a bookmark in the text: “I will read 3 chapters and a Psalm every day and on Sunday 5 chapters and a Psalm…” I read that Bible from when I was eight to when I was 15. I wonder what she thought of that commitment? I wonder if it made her think about her own commitment to read? We try to encourage her to read first thing in the day, before she reads anything else just for fun. You can’t be legalistic about something like that. I just hope and pray that God’s Word becomes as important to her as it is to me. As it always has been to me. Pray with me, won’t you, for our children? Pray that they would have a love for God’s Word, and a desire to commit to the good habit of reading it? I will pray for you as parents, that you would influence your children in a positive way and leave a legacy that lasts. How To Be Beautiful in 5 Easy Steps!